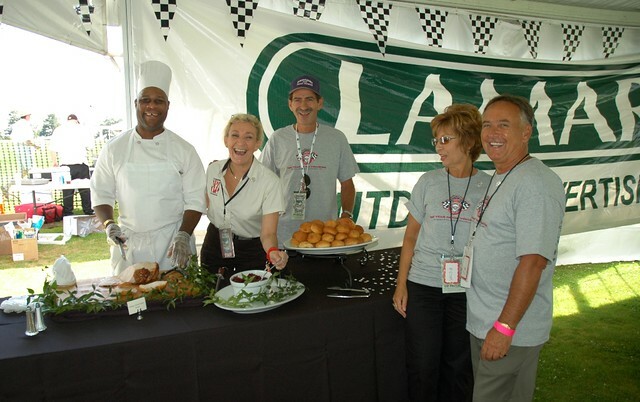 The Lamar Pavilion is one of the best ways to enjoy the Grand Prix. It’s a private track-side tent with a great view of the races only 75 feet away. It is also right in the middle of the International Car Show on the golf course so you can see the cars and visit the other sponsor tents. Many of our sponsorship packages include an option of selecting tickets to the Lamar Pavilion over the option of erecting your own tent, renting tables and chairs and catering a meal. Lamar Outdoor Advertising hosts this special tent near turn 15 along the racecourse in Schenley Park. Tickets are only available to organizations through formal PVGP sponsorship and are valued at $250 per day. All amenities are taken care of including a full service lunch buffet, deserts, soft drinks, cold Hofbräuhaus Bier and Mazza Wine. The 3,200 square foot tent is decorated and supplied with large 6′ round tables and padded chairs. This is a great location for race fans who want to get close to the action or car show aficionados. It is also a great refuge to get out of the sun and relax. Wrist bands allow guests to come and go as they please from 10:00 am until 4:00 pm. Saturday: Caribbean Style Grilled Boneless Chicken Kabobs, Asian Pear and Cheddar Sausage with Sautéed Cubanel Peppers, Slow Roasted Pulled Pork Mac & Cheese with French Fried Onions, Eggplant Rollatini, Sautéed Fresh Corn & Black Beans, Fresh Cucumber and Long Bean Salad with Shallot Vinegar, Fresh Fruit Salad and Sliced Italian Rolls & Butter. For dessert: Assorted Miniature Gourmet Cheesecakes, and Covered Chocolate Brownies. Sunday: Slow Roasted Beef Brisket Carving Station, Pan Sautéed Chicken Scampi with Roasted Garlic, Lemon & Wine, Homemade Cavatelli Pasta with Vodka Sauce and Smoked Bacon and Early Peas, Eggplant Rollatini, Roasted Brussel Sprouts with Caramelized Bacon and Carrots, Fresh Arcadia Lettuces, Cucumber, Clementine Oranges, Shaved Carrot, Shallot Vinaigrette and Buttermilk Ranch Dressing. For dessert: Homemade Miniature Pizzales, Carrot Cake, Lemon Bars, Gourmet Chocolate Chip Cookies. We also served Champagne Mimosas. Thanks to Stan Geier and his staff at Lamar for hosting the tent and displaying our billboards throughout the region!